Inout Blockchain FiatExchanger is a script developed as a platform for cryptocurrency exchange service. There are various security features added in the script so a to render a safe and secure trading platform for users. The script comes with 4 top cryptocurrencies by default with more than 80 fiat currencies to trade with. The script comes with an interactive public page and a powerful dashboard for admin. In the public page if you check, (demo available) there is a charting for market values. More clearly a candle representation is ready for the current data (for the market available). This will help users very quickly check the current market trend in the platform. Moreover, a table representation for Ask/Bid values, trade history, last market value, 24Hr low/high trade value etc are all highlighted for a quick access to the market. And in the admin page, there is a powerful dashboard, designed so as not to miss any notifications in the script. This allows the central power of the service falling into the hands of admin. It is for safety and security the team has given the prime importance while developing the script. The security feature include, Google Recaptcha, Google 2-F-A, Email Notification, IP level verification, External back-up wallet etc are all integrated in the script providing a pretty good security to the script. A clear flow of knowing your customer method is there in the script. With 3 levels of users – New, Basic, Advanced. The “New” level users need not submit any proofs and can register. But the next level of users need to submit proofs as per admin’s specification (admin can ask from the admin area). There are various revenue generating techniques in the script, ensuring the script brings profit! The main advantage of the script is the demo page, where one can actually check the work flow, before purchasing it, and at the point of any assistance, support engineers are there to serve online! Reference – Inout Blockchain FiatExchanger, Inout Blockchain FiatExchanger Demo. Inout Blockchain FiatExhanger is a new script release from Inout Scripts. This is a script to readily start a blockchain business. The script serves you to start a platform to trade cryptocurrencies with fiat currencies. Secure and safe is the script Inout Blockchain FiatExchanger, this is because the script is tightly bound with security features like, Google ReCaptcha, Google 2-Factor-Authentication, IP verification, Email confirmation on certain activities, External Back-Up wallet. All top 4 cryptocurrencies are added in the script – Bitcoin, Litecoin, Ethereum, BitconCash. And around more than 80 fiat currencies are there in the script, so that easy trading of cryptocurrencies can be carried out. There is a very interactive public page, for trading. It includes current market value, like Last Ask/Bid Value, 24Hr highest value, No. of transactions etc. So that any user can quickly see a desired trade value. A chart representation is also given (a candle representation on market values). In the admin section also the script delivers a powerful dashboard so that admin never misses a notification. The script needs an admin approval for almost all major activities, and hence the central power of the trading platform falls in the hands of admin. There is a powerful KYC method in the script (Know Your Customer). There are 3 levels of users. New, Basic and Advanced. The New level users can register without submitting any documents, the next level users need to submit documents as requested by the admin. The docs are sent to the admin’s registered email. Secure, safe and powerful is the script to start a cryptocurrency exchange service with Inout Blockchain FiatExchanger Script. There is a demo link for the script so that one can actually see its working. Some operational activities are not visible for security measures. Reference : Inout Blockchain FiatExchanger Script. Google it! Undoubtedly Google is the most powerful search engine seen so far. But some other search engines like Bing, Yahoo, DuckDuckGo has also paved its path, for example, DuckDuckGo holds its uniqueness by not tracking the search. Likewise, have you thought of building a search engine of yours? A private search engine can be easily started with a Google clone which is readily available in the industry. Some ready-made scripts offer you with the best option of hosting a Google-like search engine. The tool fetches results using an API key integration. This is a service provided by major search engines like Google, Yahoo and Bing. You can either take the advantage of all the 3 providers or any of these, all the 3 would be the best option. Now since the API integration service is a paid service, you can connect a web crawler like a GoogleBot clone. What a GoogleBot clone does is, it builds a database of its own. Just add an initial URL, and the bot starts from it till it grows to a vast database having millions and trillions of data to fetch. Inout Scripts as a clone scripts provider website got a search engine script and a crawler software – Inout Search Engine and Inout Spider. These both solutions build up a complete search solution for you. They are just some steps for installations away to be hosted and all you get is a complete search solution. You can check out some demo links we have added in our website. When you have a custom project, you usually outsource to a web-development team or hire employees right there. But have you thought of hiring employees remotely and very easily and effectively build your custom project? Nesote Team has come up with a new model for outsourcing – A Dedicated Development Team Model. We will pull out some crystal benefits of a custom project with a dedicated team program. We give you the set of technical experts working on your project remotely. Affordable, Scalable and Reliable is the proposed model. Affordability – The main attraction of the model is it’s less expensive. You might be thinking this a marketing trick, no we really mean by saying it. We the Nesote team works from Special Economic Zone (SEZ), so we do hold the advantage for a lower margin of expense. This, in turn, will bring you the advantage to spend less for your project. Allows you to hire employees at a lower expense ever. Yes, lower than what you think. Scalability – Any time you can scale up or down the size of your staff, according to the project requirement. Reliable – We are web development company working in the industry for more than 10 years, we follow general and standardized coding practices. This will help in knowledge transfer and further development of the code and hence is the model reliable. Our team owns already a set of experts, with whom we work and we know it. We will be staffing the best technical experts for your project. Because we want you to like the model and stick with us for a long-term relationship. Rather just giving a team for a namesake. We allow you to choose a member. You can fix a member only after being fully satisfied by monitoring his work for some period of time. If you are not willing to continue with a particular staff, just let us know we will see that you deserve a better. Effectively build a custom project with the Dedicated Team Program. You can better understand the model from the link below. A business turns significant when it delivers a unique service from what an existing service offers. The uniqueness may vary in product functionality, its support, its affordability and primarily its benefit. To illustrate, there are so many e-commerce websites running and are continually increasing in number day-by-day and are running successfully. If you analyse, each portal has its own benefit, like in terms of shipping, shipping charge, display manner, delivery etc. There is a mere factor in drawing the audience to your business. And that mere factor is uniqueness. You offer something exceptional, there your audience line up. I belong to a clone scripts provider team. What I see is, after purchasing the scripts clients do some kind of customization either in design or in functionality. This gives a unique business portal website installed within no time. A fully equipped and sophisticated business website! So which is good, a custom script or a readymade script? I recommend a combination of custom script and readymade script. Lets together check some points. Saves Time – A 10 minutes installation process and a fully loaded website will be ready to host. Quick Implementation – Few customization, like logo design, branding etc is carried out and the website is ready. Affordability – Unlike building a website from scratch, buying a clone script saves quite a lot of money. Altogether a new idea gets implemented. Uniqueness – Neither derived, nor inherited, but a unique piece of work is being hosted. Cost and time – A custom script could be quite costly with time-consuming as it would be a work from scratch. So the best notion is a combination of clone script + custom work. This will let you start your online business quickly yet at an affordable price. You can refer a clone script provider team like Inout Scripts where you can enjoy the service of clone scripts with custom work. Email Marketing is a strategy adopted for advertising. It should always be done along with your other digital activities. It helps to reach your audience and keeps them engaged. The initial step to your email marketing would be setting up goals, i.e what are you aiming at? Or what do you want your audience to do? Either click your gallery, book your service, buy your product or download any document etc. Accordingly prepare your email content and landing page. The next step would be to prepare a list of your potential prospects, the list should be of people who are interested in your business. If you are trying for a newsletter sign-up form, remember to keep the sheet short, the most important field you want is the email id. Minimal content with high relevance increases the purpose of email marketing. You should not add too much content in a single mail, also avoid sending too many mails with an intention to cover an entire topic. The content should be useful at any point and could also be entertaining. It is good to send personalised emails or add some questionnaires with which you can sort out one’s interest and thereby you can customise your newsletter. Your business name should be included clearly in the mail. Subject should be short and compelling, should be relating to your service. Also avoid some words like free, reminder or symbols like !, $$ etc which could trigger spam filters. How frequently to send newsletter? Send periodically, means once or twice a week maximum or once in a week or once in a month according to your business strategy. Now that people connect with internet via mobile, tablets, etc, make sure your landing pages are mobile friendly. It is always a good strategy for A/B testing while firing a campaign. Suppose you are unsure of the subject line you want to use. Here you can send some of your newsletter with a particular subject and some with a different subject and can have check for its performance. You can simply refer Inout Email Marketer, a MailChimp/AWeber clone script from Inout Scripts for a newsletter service. Search Engines are getting smarter. Gone were the days when Google used to match a keyword to retrieve a queried content. Google is becoming smarter so as to identify the intend of a search query regardless of an exact keyword. The primary purpose of such an introduction to Google’s algorithm is to evaluate the search query and identify the content. A simple example says it better. Suppose an user checks the best hotel in Germany. Google pops up the content where there is a list of hotels with reviews so as to compare. The essence here is, Google understands the intent of the query rather just pops a list of hotels. Google uses a modified algorithm RankBrain so as to evaluate the query. It is one of the parts of Google’s algorithm, being the newest. RankBrain is an artificial intelligence application. Artificial Intelligence acquires knowledge by its own or by being taught to learn. Programmed to think like humans, here it is, evaluating the query and provide with proper search result. There are private search engines made available from clone scripts provider websites. The intent of such clone script is to let users enjoy a private search within their website. The results are fetched from API keys using a third party integration. This lets your search engine fetch results onto your page and thus resulting in an increased traffic to your website. Inout Scripts has developed its search engine for the same purpose. 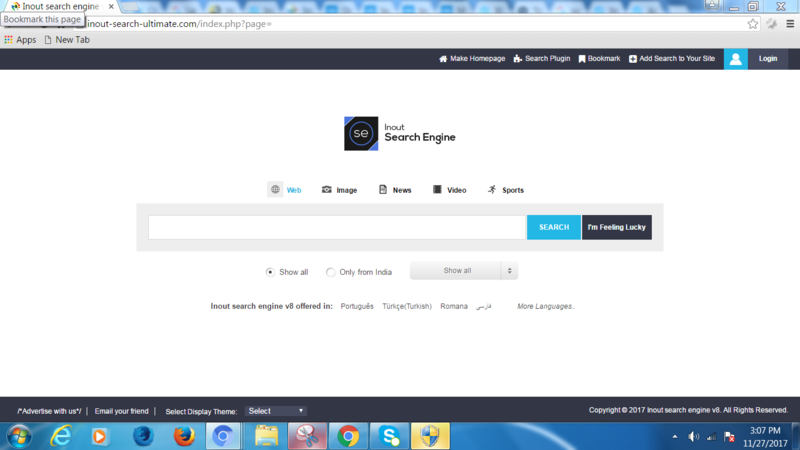 Inout Search Engine provides API key integration from major search engines like Google, Yahoo and Bing. You can add either of the services or all 3 for a better search results. Apart from integrating the 3rd party service of API, you can create your own database by using a GoogleBot clone – Inout Spider. Google has doubtlessly pioneered over all search engines and you cannot compete against it, for sure. But can own a private search engine with Google providing results. With Google updating its HummingBird (google’s search algorithm) continuously it is for sure you will be provided best results. What do we do when in need of a property? I guess we usually let some of our relatives or friends know about this or do some google searches, classifieds etc. But sometimes the search just remains as a set of results which is least concerned. Take the case, when you in need of a formal shirt, isn’t it that you do the search in a popular website like amazon rather do a google search. So it is quite obvious that if you know a website exclusively for its purpose, you can narrow the search within your favourite website. It is somewhat definite that we conduct search and utilise the result from that website. There are websites like Trulia, Zillow or Realtor which brought property management software to rent, buy or sell properties. Their work is simply awesome. Great pictures on houses, map-based search, several filters are all included so that their service is never missed.Without any burden one can choose his dream house. What I see about such website is, only major cities or countries are just listed. As of now, local listings are not included. So, why not give a local scope of starting such a venture could be thought? This thought let many clone scripts provider websites to develop clone script on property management system. And thus Trulia clone scripts evolved and entrepreneurs are excited to check its working in a local visibility. Inout RealEstate Script is a fully featured Trulia clone from Inout Scripts to build your own niche in real estate. A good article has a mystical dominance over a reader so as to influence him. Nowadays it is seen that people are fond of articles and writers are busy posting their content. So is it not a wise step to start article submission site like Ezine Articles? And thereby start your new venture on online business. No need to study an existing website. No need to hire technical staffs to get the project done. No need for a designer to design the website, etc. Once you start a website like this, you can generate revenue by several options like premium membership, advertisements etc. Admin can manually review the articles submitted and later publish them. If a good level of screening is done over articles your site can maintain a reputation of quality articles and thereby give users a quality assurance. Inout ArticleBase from Inout Scripts is an inspired clone of EzineArticles. A powerful content management system used for content posting, blogging etc which could be definitely tried for your business. I hope this brief information on building your own website on article submission helps you.